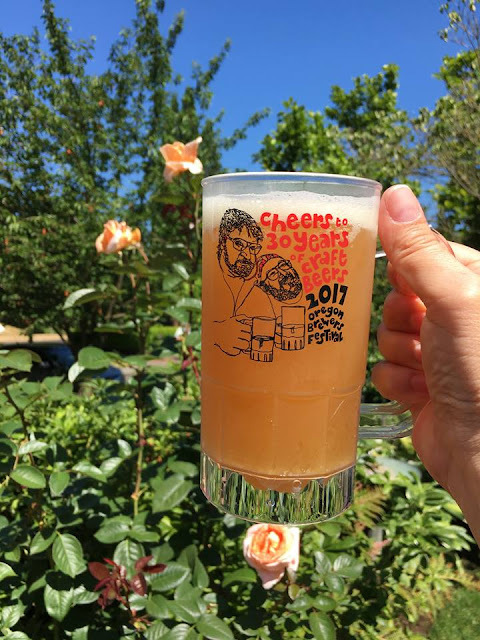 The 30th Annual Oregon Brewers Festival opens on Wednesday, June 26. The list below, compiled by event organizers, features some interesting facts about this year's OBF. In my opinion, the MOST interesting fact isn't even mentioned on this list, and has not been largely promoted. The $1 token sample pour has INCREASED from 3 oz. to 4 oz. this year. As you might expect, this is unusual because most festivals have tended to decrease pour size over time due to increasing costs. I guess we can consider it a 30th Anniversary gift to attendees! See you under the tents! 30th year of the festival. 91 independent craft beers are poured in the main festival, from 90 different breweries (Deschutes has two entries, one Gluten-Free). Another 90 independent craft beers will rotate in the Specialty Tent. Two countries are represented: Netherlands (1), and United States (89). 13 states are represented: California (8), Colorado (2), Florida (1), Hawaii (1), Michigan (1), Minnesota (1), Missouri (1), Montana (1), New York (2), Ohio (1), Oregon (56), Tennessee (1), Washington (14), and Wisconsin (1). 64 of the beers are claim to be unique to the festival. The lowest alcohol beer is Elk Horn Brewery’s Berliner Style Weisse at 3.5% ABV. The highest alcohol beer is a two-way tie at 11% ABV between New Holland Brewing Dragon's Milk Thai Curry and Caldera Brewing’s Cousin Rick Triple IPA 20th Anniversary Brew. While IPAs are the most popular style, sours are close behind. More than 40 of the beers employ fruit in the brewing process. There are three Gluten Free products this year, from Deschutes, Ghostfish and Omission. Number of volunteers at the festival: 2,000. Number of anticipated attendees: 80,000 from all over the world. The following breweries have never missed a festival: Bayern, BridgePort, Deschutes, Full Sail & Widmer. Both McMenamins and Rogue have each missed only one.